Bringing together leading writers and practicing architects including Jean Dethier, David Mayernik, Massimo Scolari, Robert Adam, David Watkin and Leon Krier, this volume provides a kaleidoscopic, multilayered exploration of the Architectural Capriccio. It not only explains the phenomena within a historical context, but moreover, demonstrates its contemporary validity and appropriateness as a holistic design methodology, an inspiring pictorial strategy, an efficient rendering technique and an optimal didactic tool. The book shows and comments on a wide range of historic masterworks and highlights contemporary artists and architects excelling in a modern updated, refreshed and original tradition of the Capriccio. The capacity of the Capriccio to create an imaginary, imagined or 'analogue' reality by combining and relocating existing or invented buildings and places in uniquely suggestive drawings and paintings offers unprecedented insights in the 'Architectural Mind'. Unlike what the word Capriccio might suggest, it is not 'capricious' but indeed follows complex rules of realism and figuration, as well as coherent narratives and semantics. It is a playful reflection of the dialectics of the real and the ideal. 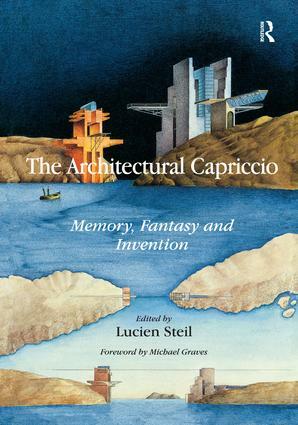 The Capriccio does not challenge the mechanism of reality, but questions the mechanic and linear reading of the real, of life and of art and offers a large palette of threads, figures, tones and nuances to illustrate and contribute creatively to the complexity of a sustainable built and living architectural environment. Lucien Steil is an Associate Professor in Architecture at the University of Notre Dame, USA and Rome.